I watch a lot of football. I play a lot of RPGs. And I've always had this theory that they're not all that different. So I went to an NFL player—probably the only NFL player who actually plays RPGs—to see if he'd agree. He did. "You can look at it as— everyone starts at level one, when you're entering even like peewee or high school football," said Chris Kluwe, a punter for the Minnesota Vikings and self-proclaimed RPG nerd. "You gotta train your skills and hopefully level up to make it to college and then to the pros. The boss fights are kind of brutal, let me tell you, sometimes." For example: Devin Hester, one of the most dangerous punt returners in the NFL and Kluwe's greatest nemesis. "Yeah, definitely. I'd say he's an end-game boss fight," the punter said, laughing. It's not just levels and boss fights. As my buddy Chris Dahlen once pointed out, there are quite a few parallels between gridiron and a traditional role-playing game. Teams take turn attacking and defending, each trying to do as much damage—or score as many points—as possible. General managers are constantly looking to upgrade their parties. And every NFL player is always training to boost his skills. "How I knew I was good enough to kick in college was the kicking camp I went to, the guys that ran it, they had punted and kicked in the NFL, and they told me: 'Hey, if you work at it, you have the potential to be good enough to kick in college, and you definitely have a shot at the NFL,'" Kluwe said. So he worked at it. And kept leveling up. "That's kind of the interesting difference between football and RPGs. You don't know that you've leveled up until you made it, then you know, okay, I'm at that level." Hey. Maybe RPG designers can take something out of this parallel. In an RPG, everything is neat and pre-determined. To level up, all you have to do is gain experience points. There's no chance you might not make it. No way to miss out on your dreams. Of course, that's one of the reasons we like playing RPGs: it's comforting to know that, unlike the real world, no matter how many times we screw up, we'll always be able to do well. 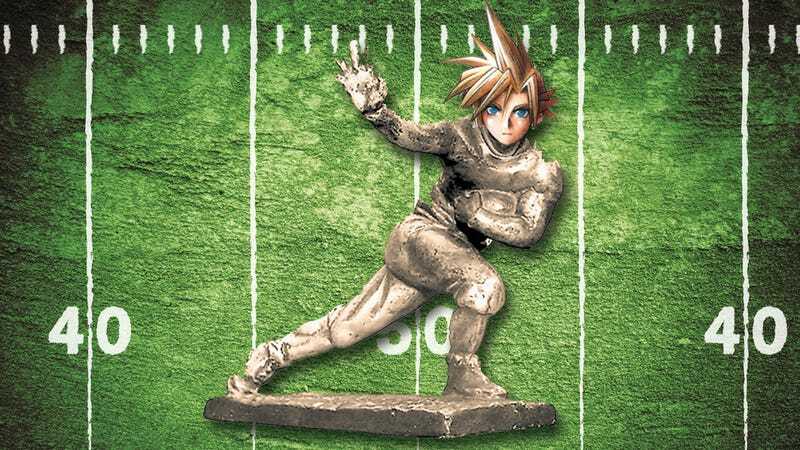 Kluwe didn't know he'd be an NFL punter, but we know that Cloud will become a super soldier. It's destiny. It's a video game. But it's fun to imagine an RPG that feels more realistic. A gritty, dark role-playing game that puts you in the shoes of a warrior who maybe won't always make it. Maybe you'll fail. Permanently. Maybe you won't be able to get stronger. Maybe you're not good enough to be the chosen hero. Maybe you're stuck playing soldier or guarding a town instead of going out and saving the world. Maybe you won't make it to the NFL. "I think maybe [RPGs should] just hide the numbers in some cases," Kluwe said. "A lot of the time in RPGs it's about stats—a sword that gives you an extra six power or whatever—while in football, you don't really know until you actually go out and do it. So if you have areas, kind of like Dark Souls, where you don't really know if you're strong enough to take on a boss, but once you figure out their patterns, once you learn the skills necessary to do it, then you can defeat it... that's kind of like football. Once you first start out, you might not know exactly what they're doing. The more you practice it, then you realize you can win." On the other hand, there's always going to be room for RPGs that love crunching numbers. Kluwe agrees: "Half the fun of RPGs is when you get up to level 99 and you just walk around the world killing everything. Look at Disgaea. I think there definitely is a place for having those numbers. It can be fun to kind of theorycraft, figure out which stats work best." But I'd still love to see an RPG that's more like football, more like a professional sport in the way it treats your character. It might not seem so fun to play a game in which winning isn't a guarantee, but maybe it'd be more rewarding. It'd certainly be interesting. "How do you quantify a person's ability when it can change year to year?" So what about Madden, I asked Kluwe. What do NFL players think of the game that stars NFL players, a game that many people have compared to an RPG in many ways? "Sports games are the one genre of video games I don't play," Kluwe said. "Although people have told me that apparently Madden upgraded me this year. I think I was in like the mid-70s before. Now I'm in like the mid-80s." That shifting number is what determines the value of every player in Madden, of course. People love reading the stats, seeing players' numbers change every week. Gamification of a real-life game. I told him that if I played football, I'd probably obsess over my Madden stats. Do players do that? "We'll talk about the stats in the locker room," Kluwe said. "Most of the time it's based on popularity. If your name is in the newspaper, if you're on SportsCenter then they'll bump up your stats. But they don't know. How do you quantify a person's ability when it can change year to year?" That's a good question. In many ways Madden's quantification of players is an attempt to turn the NFL into a neater, less random game. To turn it into more of an RPG. Maybe we should go the other way. Maybe some RPG designers should be looking more towards the NFL, learning from the underdog stories and randomness and sheer drama that pervades every element of professional football. I'd love to see more role-playing games in which success isn't pre-determined; it's earned. Like football.